Hey folks, there’s no doubt that high intensity and low intensity exercise such as a Tai Chi program, or a light Pilate’s work out can also be very beneficial. In part 6, of this interview series TACFIT Commando Designer and Founder, Scott Sonnon recommends integrating“circuit style” training into high and low intensity level programs. 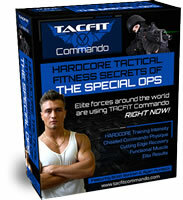 Now today, we’re going to look at what a new person coming to TACFIT can expect. Craig Ballantyne: What can an average person who works out and has been doing more traditional weight training, some interval training, a little higher intensity stuff except to feel like after those first workouts? You mentioned having more energy as soon as you’re done, which is going to be great compared to you know most people who do these work outs until they’re completely exhausted. Tell us a little about the physiological response they’re going to have from the first couple of workouts they’re going to have? Scott Sonnon: Okay, it’s a solid request. So, basically what happens to be if we move in a way that is a natural to the range of motion of our joints, this is what tactical means, and when we think of tactical we immediately think of camouflage, for some reason, but we’re all neurological predators. The way our nervous system is organized is to be able to survive in a crisis. We have binocular vision; our eyes aren’t on the sides of our head like fish. So, when we move in a certain way that opens up all of our joints throughout the movements we get flushed with this sudden influx of energy. All of our energy isn’t locked in cold storage; it takes a high intensity workout to not just give us the movements to release that, but also the intensity to burn off the barriers to releasing that energy. When we go into a workout, say there are six movements from a very basic movement to some of them you may not have seen before. You’ll be able to do them right away because there are four levels of sophistication to each movement. The basic three levels we call recruit, grunt, and commando. Everybody gets to use the same family of a skill. If I’m doing a push up and the guys who are training next to me may be doing a ply metric screwing push. It’s the same skill family but we all train together. I can do the same basic gross movement even on my knees, the point isn’t to do the movement but to complete the program with the caveat that I must progress in complexity, to BECOME BETTER not just bigger. Bigger, stronger, faster is fantastic when it’s necessary, but it’s only the first step, it’s sort of like nutrition. Calories in, calories out isn’t all of nutrition, but it is the first step. We have to first be able to consider what we’re putting in our body and what we’re putting out energetically. The same is true when it comes to movements. We also have to realize that only better is better. So we have to improve the movement that we’re doing. These six exercises you could be doing a basic knee push up; there are little tricks that we give you to be able to put out more volume. If we know how the core works, it is like a Coke can, you know you have a bottom and a top on the can. The only way to truly crush the can is to spiral twist it and then press it together and that’s the way our core works. We have the transverse abdominals that we have to pull in. We have the rectus abdominals that have muscle (six packs) on top we have to crunch down. However, we also have the pelvic wall on the bottom which we can only do by squeezing, gals you know it as Kegels, guys you know it’s the muscle that you have to squeeze in order to avoid peeing. We have to pull up the bottom of the can as we crush down with the tight exhale to push the diaphragm down and that crushes the can. If we don’t have a solid core then anybody that has children knows that when a child’s having a tantrum trying to pick up that child is like trying to pick up a 200 pound sandbag. The sand just pours out the other side, and you have this really awkward heavy thing to try and pick up. A 200 pound plank is much easier to pick up because the weight is evenly distributed, so the tighter the lighter. The goal is to make the body as tight as possible and that means it’s as light as possible. We have to start with the CORE so that we can create a union between the upper and lower bodies. Every technique has little components to it in order to get more volume out of it so that we can truly have high intensity. Even though there are only six movements that we have to do there are little tricks and tips to each one of those movements and the protocol that we do them is very important. The first protocol that we use is 20 seconds of work with 10 seconds of rest, also known as Tabata protocol. It’s the first in six protocols, six programs that we use in TACFIT. This is the entry level, because we have to trick the nervous system. Nobody can tell us that we need to work harder. To be able to actually do that requires some type of motivation that doesn’t come from our mind. You can’t tell the mind to do more you have to tell the spine to do more. So, “In 20 seconds I have to do as many of these as I can, and then I have 10 seconds to recover before I have to do it again,” that encourages us through time to be able to push harder and recover faster. And there are specific recovery methods during those 10 seconds. THE 10 SECONDS are more critical than the work. Recovery is king workout is queen. It tends to be viewed the other way around. It’s the recovery methods that we need to focus on in the 20/10. So, the methods that we use are, they can seem a little strange, but it’s amazing the change in numbers that happens. If you think of doing one activity for 45 minutes, let’s say riding a stationary bike unless there’s some type of program on the stationary bike that encourages us to have the intensity our mind can’t push to high intensity. When we compress it to 20 seconds we can push hard for 20 seconds chemically. We can push really hard and in those 10 seconds we can RECOVER before the next set. It’s much different than doing the same thing 45 minutes in a row. Twenty seconds is short enough that the spine can push, 45 minutes, we lose focus. It’s like Zen Buddhism, 45 minutes of the same activity. Being able to hold your form, most people are damaging themselves every single time they’re taking another turn of those pedals, because if the minds not absolutely prepared to handle the technique than the body starts to find a cheat, it tries to find the easiest way to accomplish the activity. In 20 seconds, we can hold our attention. We can actually use high intensity and use these little tricks and tips that will give us all the benefits that we need. Twenty seconds are more important than 45 minutes and that’s the first protocol, the 20/10. That is it for today. We’ll be back tomorrow with part 8, as the TACFIT author Scott Sonnon answers more questions on complex movements.